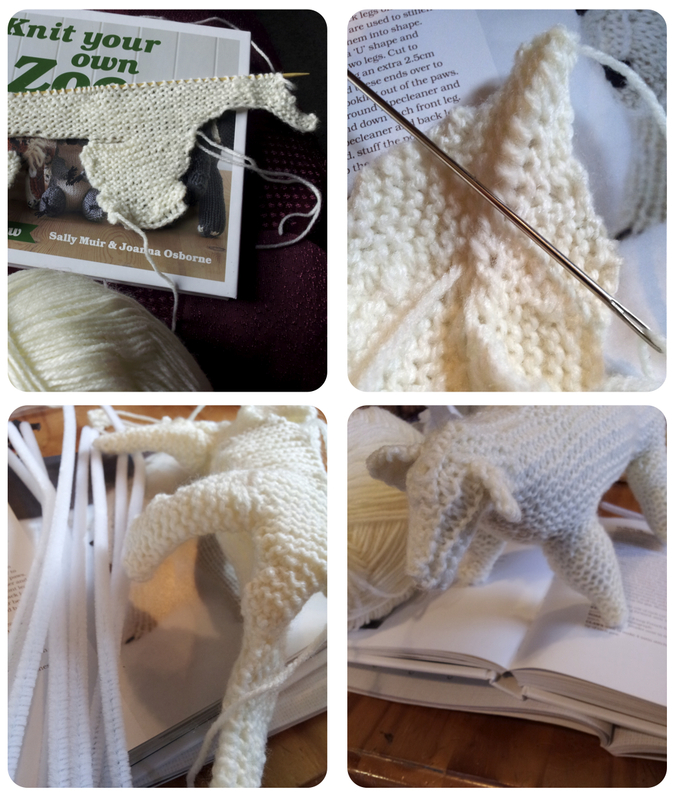 The first week of my big knitting challenge for charity is complete… & so is Mr Polar Bear! He’s a rather slim Polar Bear, particularly in the face, & there was a slight incident with one of his legs (more on that to come! ), but still – definitely a bear, wouldn’t you say? & not bad for a first ever attempt at knitting? Remember, before this project I’d never knitted anything at all, not even a scarf! When I came to sewing up the different parts of the Polar on Saturday, I realised I’d knitted on one of the front legs the wrong way round. I’m not quite sure how I managed it, but due to the nature of this challenge – I only have 10 weeks to complete 10 animals of increasing difficulty, after all – I was forced to improvise rather than start again. The legs of the bear are stiffened using pipe cleaners, as well as stuffing, so I used this to help manipulate the leg into the right position, and had to sew up the seam on the outside rather than the inside. Not exactly perfect, but it’s given him ‘character’ & taught me to be extra careful which way round I attach limbs in the future! His tummy and ears were relatively quick to knit, and I’m beginning to feel more confident with basic knit, purl, stocking stitch, and even increasing (which was my worst knitting nightmare at the start of the week.) I need to neaten it up now. How do you recommend counting stitches/keeping track of them? I was tying a different coloured piece of yarn round the stitches to mark where I needed to knit to but there’s probably a much easier way. I think another thing I really need to work on this week is not making my stitches so tight. I think this contributed to my Polar Bear’s slightly malnourished look, bless him. This week, Week 2, is Elephant week. It’s my next animal, my next challenge. Looking through the pattern, I can already see some bits that are making me nervous but I’m going to start work tonight, & shall blog my progress mid-week. It would be really lovely if you could visit and share my JustGiving page. All this crafting is for a cause, and it would be wonderful to raise some money for the World Wildlife Fund whilst bravely pushing forward with my newfound knitting ability (ok, ability might be pushing it at this stage!). The knitting skills required are only going to get more difficult as the weeks go on! I read through lots of the Handmade Monday blogs last week & am looking forward to again tonight! It’s always nice to catch up with other crafters and see what they’ve been working on all week! Wow I think your polar bear looks amazing. Never mind the leg incident, he’s got four legs so what’s he got to complain about. You should be really proud. I’m sure your confidence will grow every week. I can’t wait for the next installment. Happy knitting. Polar bear turned out very well in the end! It’s hard not to make stitches too tight, I still do it after years. I use coloured plastic stitch counter rings which are very easy to attach and move as needed. Can’t remember where I bought them though! Ah I see – I’ll have a google to see if I can find something similar. I think I panic that I’ll drop a stitch & pull them really tight! He’s gorgeous! Can’t wait to see the elephant. My grandad knitted me an elephant when I was born! Aww, that’s lovely. Do you still have it? He looks gorgeous and obviously turned out very well in the end. Hope you have a good week. Thank you. I hope you had a lovely week too! 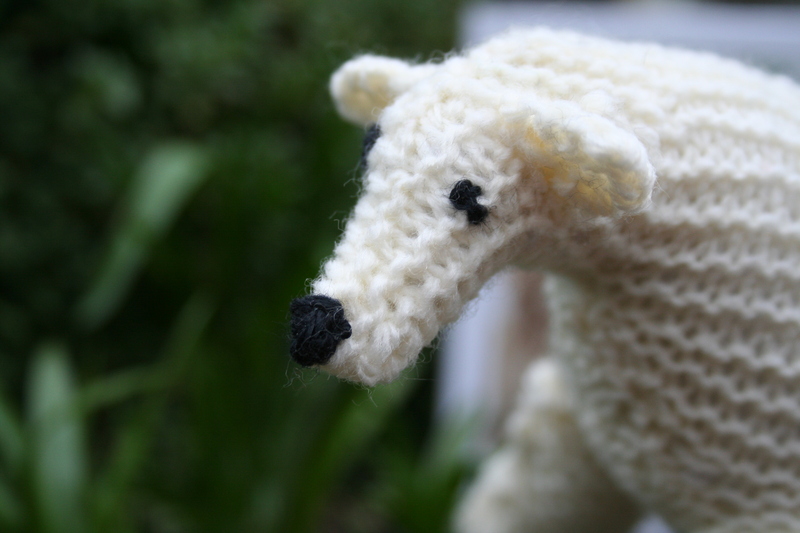 A charming polar bear, and huge congratulations on finishing your first ever knitted project. Good luck with the elephant. Well done. He is very cute. I can’t wait to see your elephant. Have you considered making a giraffe, then some lions, then unravelling the giraffe and feeding it to the lions in the style of Copenhagen Zoo?! The story of Marius really shocked & upset me. 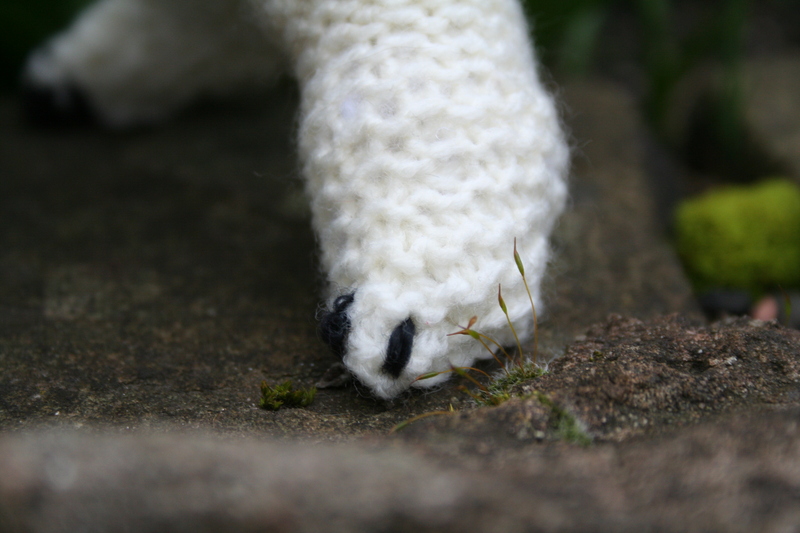 & it was partly why I was keen to support the World Wildlife Fund who work so hard on conserving the real life counterparts of my knitted creations & sustaining their natural habitats. He came out lovely , I especially like his little face. Can’t wait to see what else you come up with.